The 2018 Supreme Court Race Was An Oddity. Here’s Why It May Have Played Out That Way. LANSING (APRIL 11, 2019) — They brought lawn chairs. They carried signs that said, “End Political Gerrymandering” and “Make Every Vote Count!” And they — more than 100 demonstrators — rallied outside the Michigan Hall of Justice on July 18, 2018. 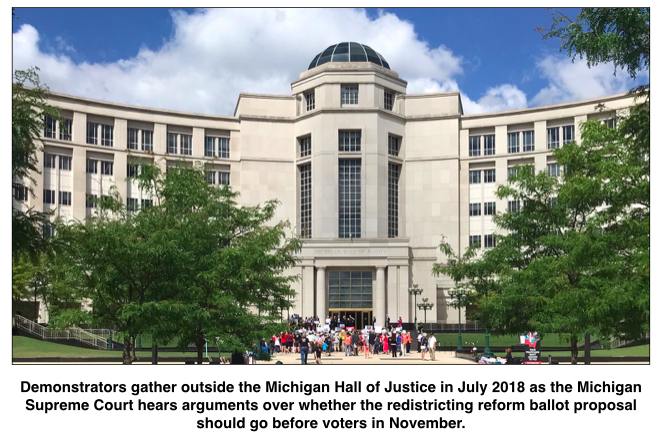 Inside, Michigan’s highest court heard arguments over whether a ballot proposal to change the state’s redistricting process qualified to go before voters in November. It was not a normal day at the usually quiet headquarters of the Michigan Supreme Court. The election that took place three months later to fill two seats on that court was not normal either. Michigan’s 2018 race for the Supreme Court was defined by what it lacked: It did not see large, under-the-radar spending by groups acting outside of the candidates’ campaigns. That type of spending had been a staple of Supreme Court races in the state for nearly two decades. The fact that it didn’t happen in 2018 left some political observers scratching their heads and others believing that it was because of frustration with one of the candidates who had gone against the wishes of her party. Michigan Supreme Court justices serve eight-year terms. However, when a new justice is appointed to the court, that person has to run in the next election. Usually, anywhere from one to three of the seats on the seven-member court are up for election every two years. There were two seats held by Republican-nominated justices up for election in 2018. Republican-nominated justices held five of the seven seats on the court. So, the majority was effectively up for grabs. 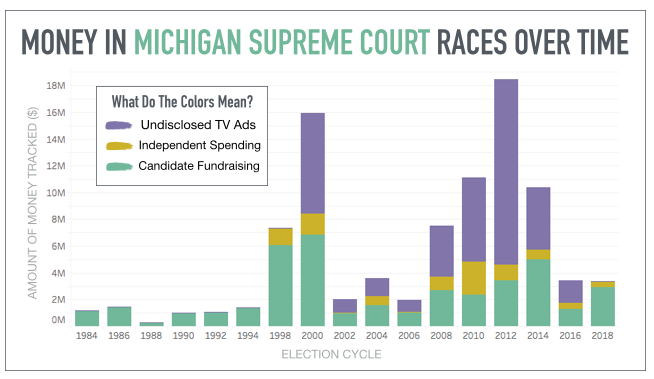 For every Michigan Supreme Court election going back to the 2000 — 18 years ago — the races had seen at least $800,000 in spending on TV ads that either criticized or praised the candidates and were sponsored by anonymous donors, according to MCFN's tracking. Because the ads didn’t specifically endorse or oppose candidates, the spending didn’t have to be disclosed to the public. The anonymous spending peaked in 2012, when there were three seats on the ballot. Through disclosures made by broadcast TV stations and cable systems about ad time they sell, MCFN tracked $13.8 million in undisclosed ads about the Supreme Court candidates that year. In 2016, there were two seats on the court up for election. And although the two incumbent candidates won by more than 900,000 votes each, MCFN still tracked $1.7 million in undisclosed spending on TV ads in that election. The Michigan Chamber of Commerce, which backed the Republican candidates, was responsible for $1.5 million of that total. The 2018 election was a much different story. There were also two seats up for election in 2018, but MCFN was able to track very few TV ads about the Supreme Court candidates last year. Cable provider Comcast reported only about $47,000 in spending in ads by the Michigan Republican Party on ads promoting Clement and Wilder. Political operatives watching or involved in the 2018 race suggested two main reasons for the drop in spending: One was that the political parties were more focused on other races on the ballot; and the other was frustration among some Republicans with one of their nominees. That nominee was Justice Elizabeth Clement. Clement, appointed by former Gov. Rick Snyder, had voted with the court’s two Democratic nominee on multiple key decisions, including whether the ballot proposal to institute an independent redistricting commission should go before voters. Clement and fellow GOP-nominated Justice David Viviano joined the two Democratic-nominated justices in determining the proposal wasn’t overly broad and could make the ballot. Many Republican operatives had argued the court should keep the proposal off the ballot. The ballot proposal later gained the approval of voters. A political consultant who declined to be named said traditional Republican interest groups had “largely cut her loose,” referring to Clement. 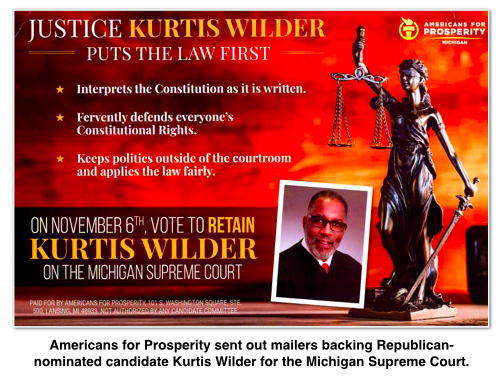 One group, Americans for Prosperity, reported spending $114,427 promoting only the other Republican-nominated Supreme Court candidate, Kurtis Wilder, according to disclosures. Americans for Prosperity, a nonprofit that favors conservatives, didn't have to disclose where its money came from. The Michigan Republican Party did spend money promoting both Wilder and Clement but it was less than the party spent overall in previous election cycles. Party spokesperson Tony Zammit said the reduced spending level had been dictated by the circumstances. “With all of the statewide races being competitive and both the state House and state Senate in play resources needed to be spread around more than in other cycles,” he said. Clement and fellow incumbent Wilder were the two GOP nominees up for election in 2018. The Democratic nominees were Samuel Bagenstos, a professor at the University of Michigan, and Megan Cavanagh, an appellate attorney and daughter of former Michigan Supreme Court Justice Michael F. Cavanagh. 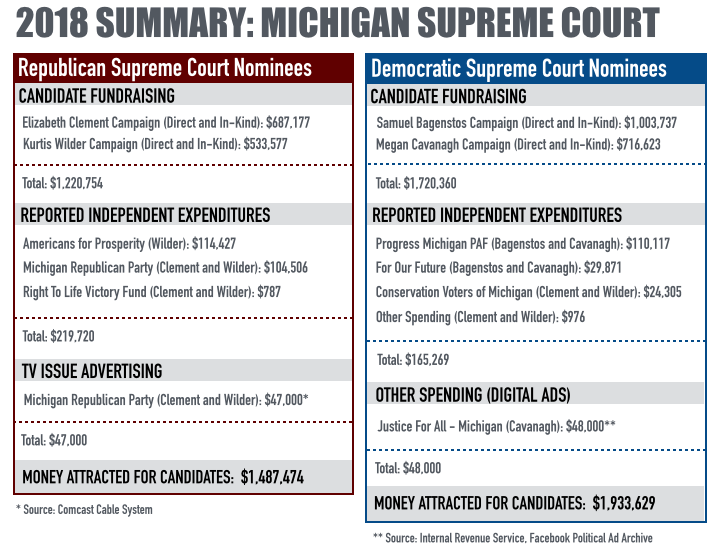 The Michigan Democratic Party hasn’t spent heavily on Supreme Court races since 2012. In 2018, it didn’t spend much either as it more heavily focused resources elsewhere on the ballot. According to campaign finance disclosures, the party’s committee spent $128,545 each on digital ads in support of Bagenstos and Cavanagh. It later gave an additional $7,454 to Cavanagh. The Progress Michigan Political Action Fund super PAC ($110,117), For Our Future Michigan ($29,871) and the Conservation Voters of Michigan ($24,305) reported independent expenditures to benefit both Bagenstos and Cavanagh. According to multiple sources, Democrats came to believe that Cavanagh had a better chance of winning one of the two seats than Bagenstos. That’s despite the fact that Bagenstos has raised the most money for his own campaign: $1.0 million. Cavanagh raised $716,623. 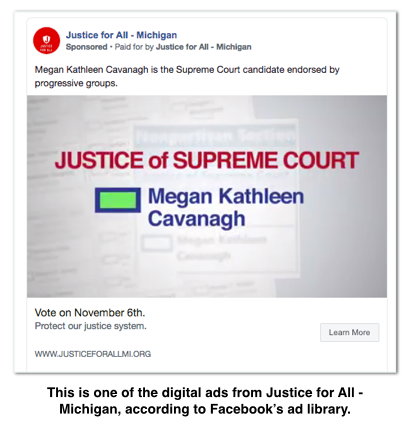 A group called Justice for All - Michigan began running digital ads on Facebook supporting only Cavanagh in the final days before the election, according to Facebook's ad library. However, the group doesn't appear to have filed campaign finance disclosures with the state of Michigan. According to Facebook’s ad library, the group spent about $48,000 on digital ads with Facebook. MCFN noticed the digital ads only because of checking the Facebook ad library. Because it was a 527 political organization, Justice for All - Michigan filed regular reports with the Internal Revenue Service. In those IRS reports, it reported spending $140,000 on digital advertising. It’s unclear whether all of that spending went to benefit Cavanagh. The group gave other dollars to Democratic organizations. Justice for All - Michigan’s top donors were the United Auto Workers Voluntary PAC ($135,000) and the Detroit law firm McKeen & Associates ($125,000). Cavanagh narrowly won one of the two seats on the court. She got 1,584,512 votes (25.3 percent) to finish in second overall while Wilder got 1,519,394 (24.2 percent). Bagenstos got 717,062 (11.4 percent). Clement, who had received contributions from both the Michigan Education Association and the Michigan Chamber of Commerce, got the most votes at 1,871,462 or 29.8 percent. She did it with very little outside spending to benefit her. The Michigan Republican Party reported spending just $104,506 on independent expenditures to benefit Clement and Wilder. The party also ran at least $47,000 in cable TV ads to promote the two nominees, according to Comcast. Those are relatively small spending figures considering in 2016, the Michigan Chamber of Commerce ran about $1.5 million in TV ads to back the GOP-nominated Supreme Court candidates. In 2014, the Michigan Republican Party ran about $4.1 million in Supreme Court ads, and in 2012, the Michigan Republican Party ran about $6.7 million in ads. In July 2018, Ballenger's website predicted that if Clement didn’t agree to hear a challenge to the Court of Appeals ruling to allow the redistricting ballot proposal to go before voters, funding from Republican donors could "dry up." While the court did hear arguments in the case, Clement eventually ruled against the wishes of many Republicans. Ballenger noted in an interview this week that Republicans were unhappy with Clement. “The real mystery is why didn’t the Republicans put more money in for Wilder,” he said. Top direct campaign donors to the Bagenstos campaign were: the Michigan Democratic State Central Committee ($128,545); Bagenstos himself ($71,461); the Michigan Association for Justice PAC ($25,000); the Michigan Regional Council of Carpenters PAC ($20,000); and the Michigan Education Association PAC ($15,123). Top direct campaign donors to the Cavanagh campaign were: the Michigan Democratic State Central Committee ($136,000); the Michigan Association for Justice PAC ($67,999); the United Auto Workers PAC ($15,000); the American Federation of State, County and Municipal Employees PAC ($15,000); and the Michigan Education Association PAC ($15,000). Top direct campaign donors to the Clement campaign were: the Michigan Republican Party ($50,000); members of the Reid family, Bidco ($20,061); the Michigan Chamber PAC ($15,000); members of the Dedvovuknj family, Metro General Contractors ($13,600); and members of the Weiser family, McKinley Associates ($13,500). Top direct campaign donors to the Wilder campaign were: the Michigan Republican Party ($100,000); the Michigan Realtors PAC ($20,500); the Michigan Chamber PAC ($20,000); members of the Moroun family, Central Transport ($13,600); and members of the Weiser family, McKinley Associates ($13,500). * After this report was posted, the Michigan Association for Justice provided a statement. The statement said in part: "The contact from MCFN was the first notice MAJ had regarding a potential concern regarding state filings, although MCFN has noted that all federal disclosures were timely made. MAJ immediately referred this concern to counsel to make absolutely certain that, if there were omissions, they will be addressed and remedied promptly. We thank MCFN for the service it provides to the electorate."